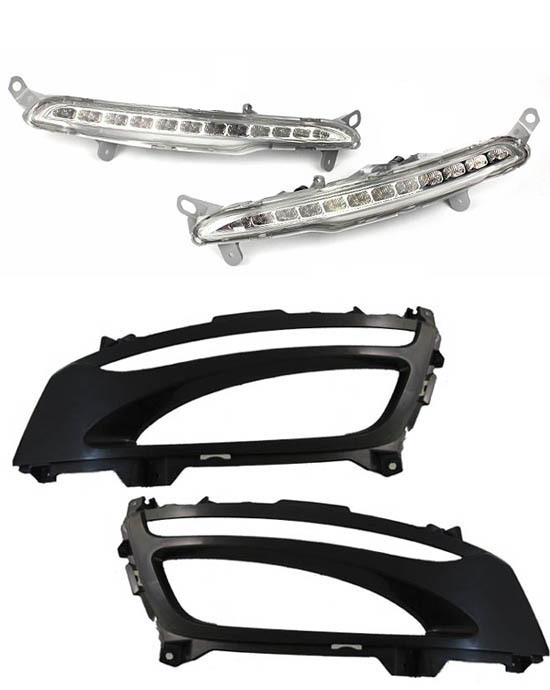 With the resurgence of two prominent Korean car manufacturers, aftermarket companies have a new niche to supply parts to. Take for example, the Kia Optima which was reinvented and designed in 2010 which has been a great success with regular consumers and car enthusiasts alike; this vehicle has been the subject of many aftermarket parts being introduced due to its wide popularity. 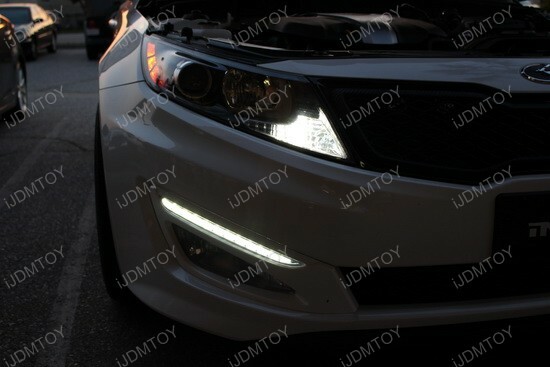 One of the most popular items we sell for the Kia Optima is our Direct Fit LED Daytime Running Lamp. 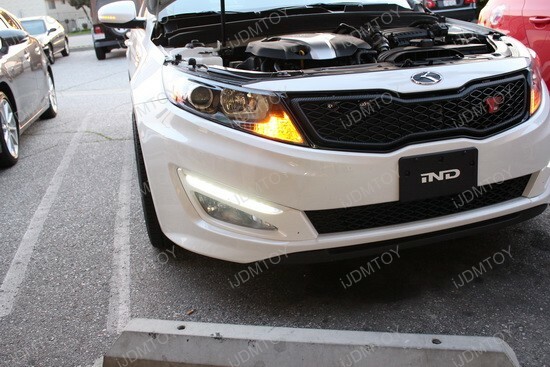 These lights are a direct replacement for the fog light bezel area and will only fit the non-Hybrid trims and vehicles with factory equipped fog lights ONLY. Trimming of the crash beam will be required as this item is designed specifically after the Korean model which does not have a crash beam like how we do in the United States. The bezels come unpainted so you have the option to paint it if you desire. The installation procedure is very straight forward and can be by a professional or anybody with sufficient experience in the aftermarket installation world (the installation requires removal of the bumper and modification of the bumper crash beam). As for wiring, these lights are available in two modes: Bright Mode and Dim Mode and you are given the choice to choose which one to use; most of our customers prefer the brighter mode for obvious reasons. On the same vehicle, we also installed our 27-SMD 1157 LED Switchback bulbs WITH LED load resistors. For some of you who are not familiar with what a switchback LED bulb is, it is an LED bulb that stays lit as Xenon White when the parking lights are running and once the turn signals are engaged, the light blinks Amber. 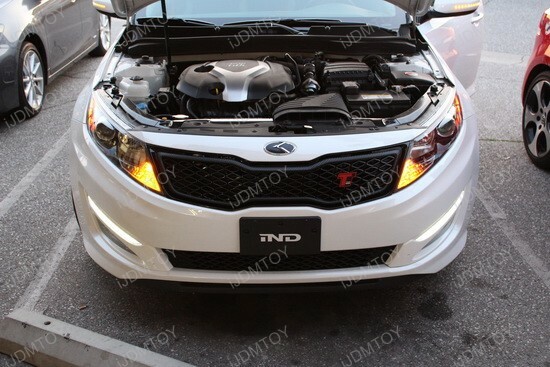 This type of design allows for a stylish look that better matches OEM or aftermarket HID lights compared to the original bulb color and still be legal as the turn signals remain amber when signaling. Resistors are absolutely required for this specific car or else the functions will not work properly (but on other vehicles, it is more of a recommended item instead). 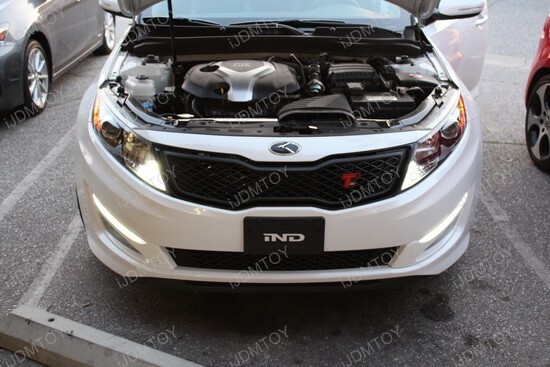 Switchback LED bulbs create a drastic change in appearance since LED white is a much closer match to OEM or aftermarket HID lights compared to the original bulb color.